Los Angeles has been officially awarded the 2028 Olympic and Paralympic Games by the International Olympic Committee (IOC) during the Session today. The ratification of the agreement, given approval at an Extraordinary IOC Session in Lausanne in July, followed a presentation from Los Angeles in which they declared their hosting of the 2028 Games “begins today”. 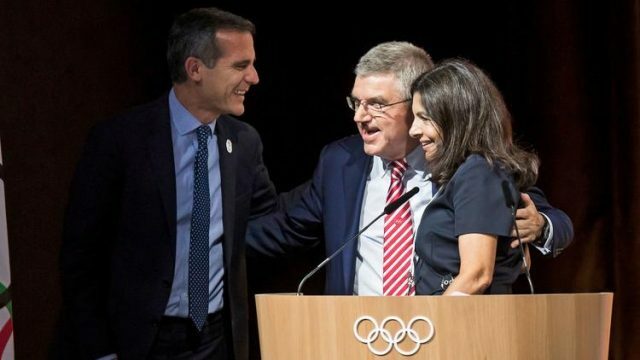 Dressed in suits and Nike Air Force One trainers, Garcetti claimed their willingness to host the later event “was a reflection of our commitment” to the IOC and the Olympic Games. Following the unanimous approval of the Session, Garcetti said: “This is a momentous day for the people of Los Angeles and the United States. “For the first time in a generation, we are bringing the Games back to the City of Angels. “Los Angeles loves the Olympics because the Games have lifted up our city twice before. Paris was officially named host of the 2024 Olympic and Paralympic Games today in front of an emotional City Mayor Anne Hidalgo. International Olympic Committee (IOC) President Thomas Bach named the French capital as host of the earlier event at the same time as he declared Los Angeles as the location for 2028. Hidalgo struggled to hold back tears as she stood alongside Bach and Los Angeles counterpart Eric Garcetti. IOC members were unanimous in their backing to mean Paris follows London in hosting the Summer Olympics for a third time after also doing so in 1900 and 1924. It came after Paris promised to use the Games as a way to improve lives across France and the rest of the world during their presentation beforehand. Their 25 minute talk was low on tension and lacked the sort of high-risk or innovative elements often seen during the finale of an Olympic bidding race. One unusual element, though, was the identity of the first speaker: French and Tunisian dual citizen Youssef Halaoua, part of a “Generation 2024 Committee” and representative of diversity and youth issues. A message of working alongside Los Angeles 2028 to deliver Olympic values was another constant theme. “Our cities are the first to feel the urgency of our global challenges and local solutions,” Hidalgo told IOC members in her native Spanish. “Our cities know that what is most urgent and crucial for humanity is to take up the challenge of climate change. “With one key objective: the ecological transition. “One driving force: Paris together with Los Angeles. “One catalyst: the Olympic and Paralympic Games. Co-bid leader, triple Olympic gold medalist, Tony Estanguet, speaking last, adopted an emotional tone when outlining their central “Made for Sharing” pitch. “Sharing the passion of an open celebration in our magical city to light the Olympic Flame in millions of new hearts…,” he said. “And sharing a responsible vision, to ensure the Olympic Flame continues to be passed forward to new cities into the future. “Paris 2024 is made for sharing. “And still one thing we did not expect was that even this victory would be shared with our friends from Los Angeles!